Is my hair included on my resume? Fron left to right: Cameo King, Briana Moss and Stephanie Cross are pictured wearing their natural hair. Photos republished with permission. Standards for most professional environments, is tailored pants or skirt, blazers and blouses, heels and ties. But is natural hair included on a resume? Most professional employers would agree that hair in a professional setting should be well groomed, clean and in a natural color state. When it comes to men and women with natural, heat and chemical-free hair styles such as afros, dreads, braids, and curls, the question of are you are good enough starts. 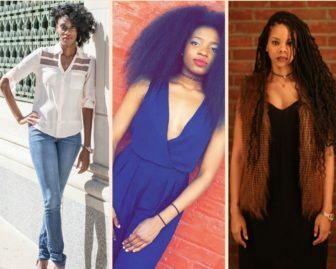 Although, the “big chop” wave is on the rise and natural hairstyles are more embraced today, African-Americans are facing dilemmas in the workplace wearing their natural hair. In Florida, Proctor and Gamble marketing executive, Sonya Kirkpatrick, wears her hair in natural braids. A year ago, Kirkpatrick was pulled to the side by her manager and was told that her braids would need to be “explained” to the other executives in the meeting. She was told that because she was in a higher position with the company, she should be up to the professional standard. Women agreed that lack of culture and being insensitive plays a role in judgment in regards to blacks with natural hair. In most cases, not knowing the culture and purpose behind the style could cause discrimination. The culture for corporate America is Eurocentric. Textured hair is considered less professional than smooth hair. And since natural hair styles are not mainstream or seen on women of influence or in power, it is not associated with professionalism. 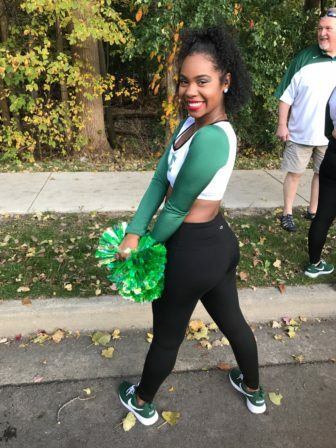 Amina Jordan, member of the MSU Elite dance team, poses in her natural hair during the MSU Parade. Republished with permission. “Hair is looked at, just like clothing,” said Karin Hanson, director of employer relations at Michigan State University. Natural hair isn’t a problem. It is all about presentation, Hanson said. “‘Well-groomed’ does not mean straight hair, it means: cleaned and combed. It’s an indication that you care about the interview or the work that you are doing,” said Hanson. Hanson also agrees that lack of culture exists. She believes, it’s a lesson employers should have. People in power could help eliminate natural hair discrimination. Cameo King, a Howard University graduate and radio entrepreneur, wears her natural hair full and curly, as a form of acceptance for herself. “Hair can be political. An expression of me,” said King. In the past, King made the journey from producing behind the camera to reporting in front of it. In that experience, she was told by directors that her natural hair would be a distraction in the reporting field. King felt white-collar settings overlooked her skillset and allowed her natural hair to block her chances for the position. King realized what was important to her. She asked herself, “are you that connected to your hair that you can’t sacrifice it for a period of time?”– she decided that she was. “Being a black woman, we get so much resistance in our existence,” said King. Other black women were able to wear the same natural hairstyle, because it was considered more “tamed” to the employers King said. King assumes the narrative associated with natural hair for both African-American women and men has a negative connotation. According to the American Academy of Dermatology, acne is one of the most common skin conditions in the United States, affecting at least 50 million people every year. Acne usually occurs during puberty and usually affects adolescents and young adults. Acne can be caused by factors such as overactive oil glands, hormones, emotional stress and foods with a high glycemic load as well as sweets.